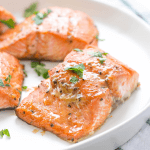 Air Fryer Salmon with Brown Sugar Glaze is sweet and really simple way to enjoy a family dinner with salmon in under 20 minutes. 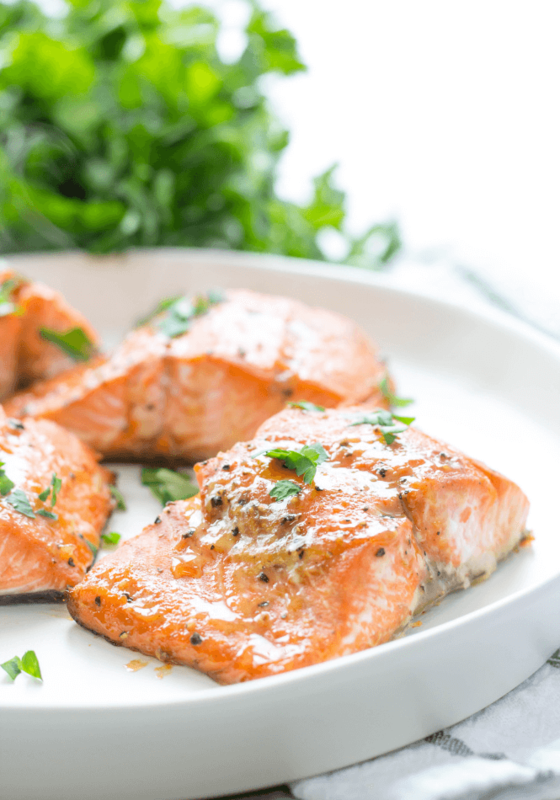 This Air Fryer Salmon with Brown Sugar Glaze is only 5 ingredients and one of the easiest dishes you can make but still has loads of flavor. The brown sugar adds a lovely sweetness and a crispy caramelized texture in some spots from that sugar reacting to heat that is pretty darn good. 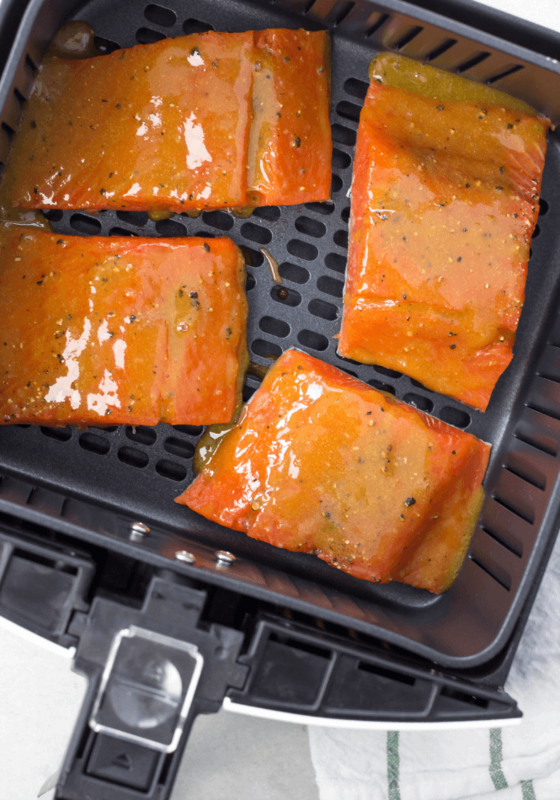 There isn’t even a whole bunch to talk about with this Air Fryer Salmon with Brown Sugar Glaze recipe- it’s just easy peasy and delicious. I do recommend buying a good piece of salmon. Look for a wild caught King Chinook if you are on the West Coast or Sockeye if on season with great marbling. The coloring should be a vibrant pink tone and when poked, it should bounce back and not leave a finger indention behind. Remove the bones from your salmon fillet and cup into 4 equal portions. Salt and pepper each side (even the skin side). In a small bowl, add brown sugar and Dijon. 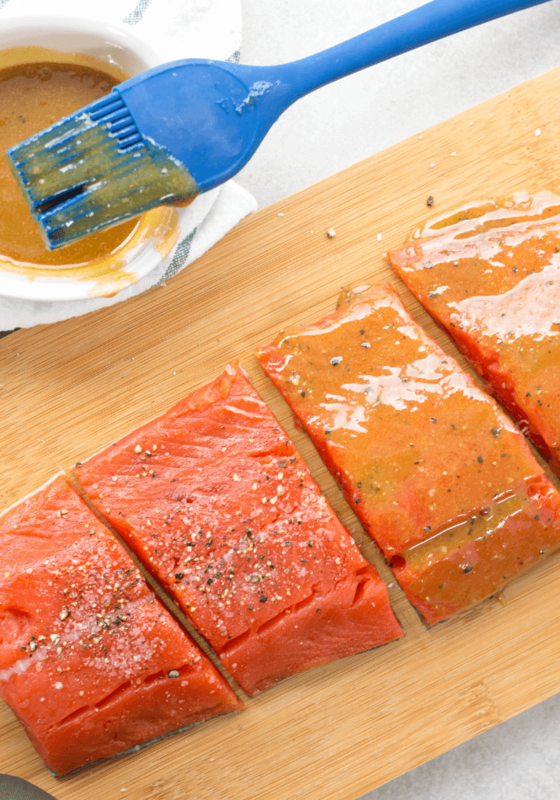 Mix and brush onto salmon. 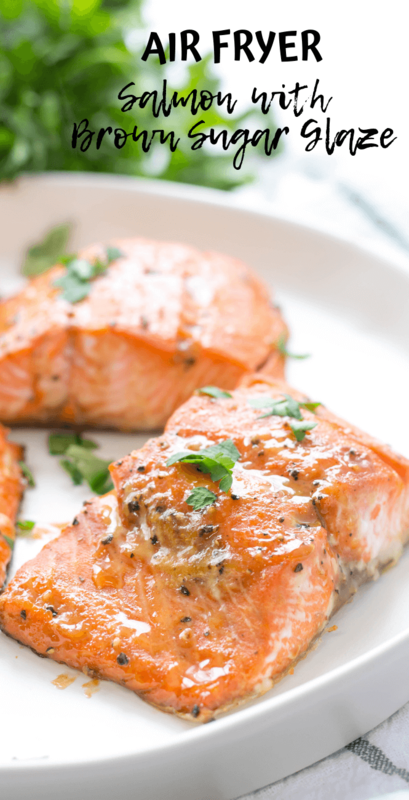 Place salmon into air fryer and cook on 355 degrees for 14-16 minutes. We like it right at 14 minutes but if you like it well done, cook a little longer. 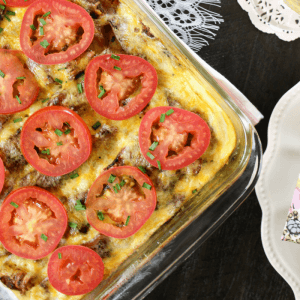 that looks delicious, great recipe!!! Thanks Patricia. The air fryer has been really great for us! We love our air fryer! So much you can do with it!